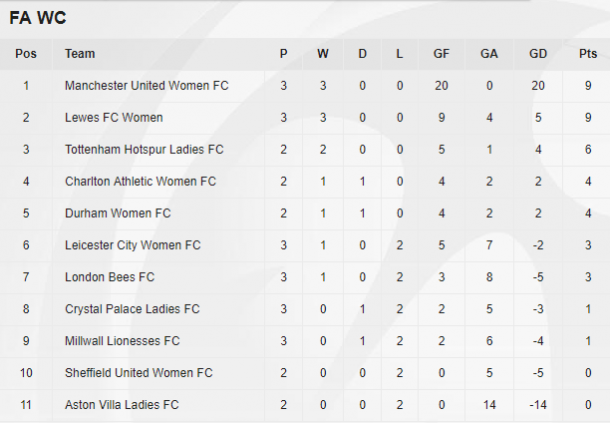 Manchester United proved once again that there is no stopping them after rout against the London Bees as Millwall and Charlton both came back to pick up respective points again Palace and Durham. On the back foot again, Lewes turned the tide against Leicester to keep their 100% record going with Spurs vs Sheffield United called off due to an unplayable pitch. Lucky not to be on the backfoot after a near-miss by Kit Graham, the Wildcats took an early lead when Beth Hepple picked out the bottom left corner form 20-yards. Needing no time at all to restore parity, the Addicks got back on level terms when Graham muscled into the box, holding Becky Salicki at arm’s length before slotting the ball into the far corner. In the end to a frantic three minutes, the hosts regained the lead when Emily Roberts skipped into the box and touched Rachel Lee’s curt pass past Katie Startup. 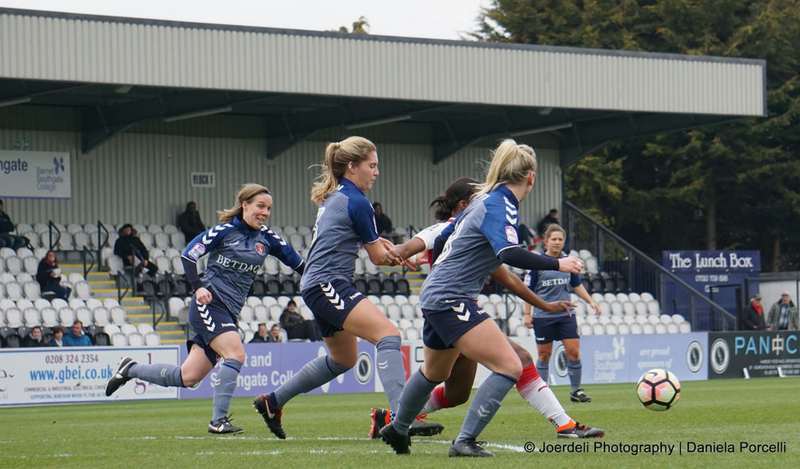 Continually testing Hannah Reid throughout the second half, Charlton finally got their second equaliser when Amelia Ritchie rose well in the box to nod Charlotte Gurr’s corner into the top right. Fans weren’t left wanting for action at the Dripping Pan as Lewes once again overturned a deficit to come away with all three points, keeping parity with Manchester United at the top of the tree. Siding in to take the ball from Leigh Dugmore, Faye Baker was fast reprimanded with the Foxes instantly awarded a penalty for the foul, the goalkeeper unable to keep Melissa Johnson ‘s clinical effort out. One fast became two for the Foxes as Johnson completed a five-minute brace, racing into the box to collect a poor back-pass before skipping around Baker and slotting home. A looping goal from Rebecca Carter after the half-hour brought the edge back into the match, with the Rookettes growing all the time. Repeating Johnson’s feat from the first half, Carter notched twice in five minutes after the break to give the hosts the lead. First, slipping the ball between Demi Lambourne’s ankles before flicking Danielle Lane’s neat pass beyond the goalkeeper at the near post. Needing just two minutes after being substituted on, Samantha Quayle put the match to bed with a low effort to tuck home Avilla Bergin’s square ball. The cushion of the fourth goal proved to be vital for the hosts as Leicester refused to go down without a fight. Fiona Worts’ stoppage time strike too much for substitute goalkeeper Nina Wilson to handle, the ball squirming from her gasp and ruffling into the net. On another goal-heavy afternoon, the Red Devils took the lead 17 minutes in when Mollie Green lucked Lauren James’s low cross behind Sarah Quantrill. Forced into an early change following Dani Lea’s injury, the hosts failed to look too assured at the back against full-time United, the Bees succumbing again just before the half-hour. Repaying the favour, Green pinged the ball forward for James to chase onto, the young attacker dancing around the defence before pulling the trigger. Two became three late in the half when Millie Turner flew in to connect with Katie Zelem’s recycled corner, her flicked header taking the ball away from Quantrill and into the far side of the goal. Left short-handed in the box, a long ball from the back proved to be the undoing of the Bees for the fourth, Kirsty Hanson’s cut-back well met by Green to nutmeg Quantrill. The match wrapped up when substitute Ella Toone slotted the ball into the bottom corner after a poor clearance. It was yet another London derby in the Championship as Millwall and Palace both got off of the mark for the season. In a match with plenty of chances it was another handful of baby-steps taken by both emerging teams, the visitors with the upper hand ten minutes in. A ball over the top managed to skip through the midfield for Ashlee Hincks to chip over the onrushing Chloe Samson, the former Lioness composed to power the ball into the empty net. With the match still nice and open after the break, Millwall levelled the scores on the hour when Gabby Ravenscroft picked out the top right corner with an arrow from 20-yards. With both teams looks for stability and a foothold in the league, the point should steady both sides.